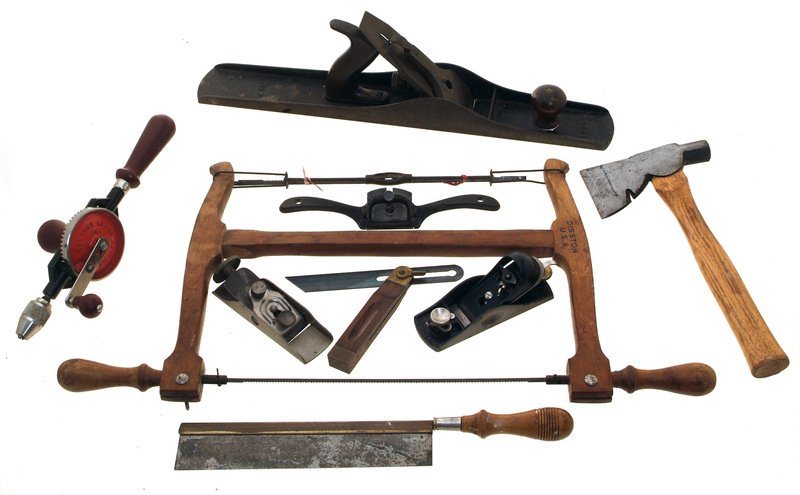 A WOODWORKER GIFT TOOL ASSORTMENT of well preserved and thoroughly practical high quality tools for the woodworker on your list. Included in this selection are a Stanley No. 7 jointer plane; a Stanley No. 9 1/2 double adjustable block plane; a Stanley No. 25 eight-inch rosewood body bevel; a Stanley No. 53 spoke shave; a Stanley No. 22 carpenter's hatchet; a Stanley Tools, England No. 03-803 hand drill; a Henry Disston & Sons wooden frame bow saw; a Sargent No. 5206 low angle block plane; and a Pennsylvania Saw Company ten-inch blade dovetail saw. All are in excellent working condition and could be put directly to use in the home shop.